Apparently, the hot new thing is to stick your iPad to the kitchen wall and then immediately start chopping red peppers. Luckily for those new to this emerging fashion, there is both a product and an instructional video available to help out. 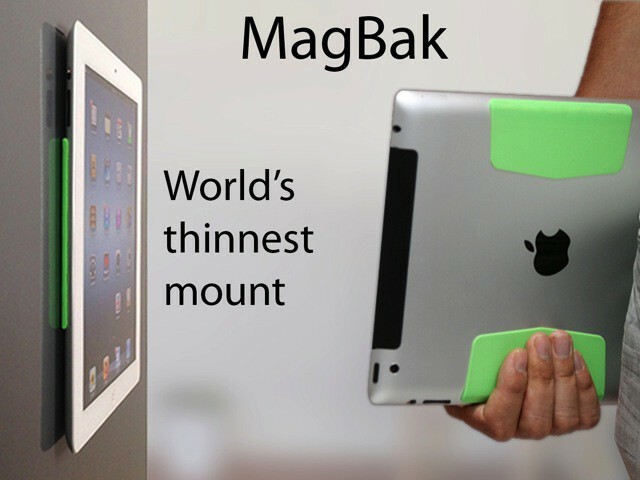 The product is the MagBak, and it consists of a pair of rubbery, magnetized pads that stick onto the back of the iPad. I’m kidding about the peppers (although if you watch the video, you’ll see a lot of kitchen-wall-sticking-and-quick-start-pepper-chopping going on. But of course capsicum decapitation is merely one use for this clever Kickstarter project. The MagBak’s magnets are not only strong enough to stick it to the door of a refrigerator, but thanks to their grippy silica surface they will also stop it sliding around smooth surfaces, and it also works great to hold the Smart Cover open, preventing excessive flapping around as you read. The MagBak also comes with a metal ring which you can stick to any old wall (although a kitchen wall is obviously best, as the kitchen is where the peppers get chopped). One MagBak (with ring) will cost you $34, or $24 if you get in early. I actually think it looks pretty neat, although I reckon a version for the iPad mini would be even better.